Project Barbatype Exhibition Catalogue- Limited Edition Signed version with 8 1/2" x 11" print. Exhibition catalogue of works shown at Beefhaus Gallery, in Dallas, TX, October 2016. 44pg, soft-cover, perfect bound, with 38 images from the show. Includes an essay by Dr. Paul Roof, a.k.a. the "Beer Can Professor". Book signed by Bryan Wing and Scott Hilton. Limited Edition Signed books come with an 8 1/2" x 11" metallic inkjet print, of any image of your choice from Project Barbatype! Indicate during checkout which image you would like. Project Barbatype now offers high quality custom-made digital inkjet prints of any image we have displayed on our website, in two sizes, magnificent 11"x14" and glorious 8"x10". Each print is done to order, and is done on a special "metallic" surface paper which we spent months trying to find, to closely replicate the look of the original tintype. 11" x 14" Project Barbatype print in a 16" x 20" window mat. Purchases are for print only. Pencil and can are in the photo to show scale. Each 11"x14" inkjet print is made individually to order, from a precision high-resolution scan made direct from the original tintype. We print on a special "metallic" surface paper that replicates the sheen of the original metal plate. The commanding visual presence of these prints has to be seen to be believed! You will be ASTOUNDED. Display it with pride! Each print will be shipped to you in a sturdy folder, so it will arrive in pristine condition. As part of checkout, you will be asked to provide the title (who is pictured) of the print you want, and re will re-confirm via email which image you would like printed. Image titles can be viewed by mousing over the images when they are displayed on the website. 8" x 10" Project Barbatype print in a 11" x 14" window mat. Purchases are for print only. Pencil and can are in the photo to show scale. That, and I love mechanical pencils and Monster. Each 8"x10" inkjet print is made individually to order, from a precision high-resolution scan made direct from the original tintype. We print on a special "metallic" surface paper that replicates the sheen of the original metal plate. Click on the image below to get a bigger image of the entire set! 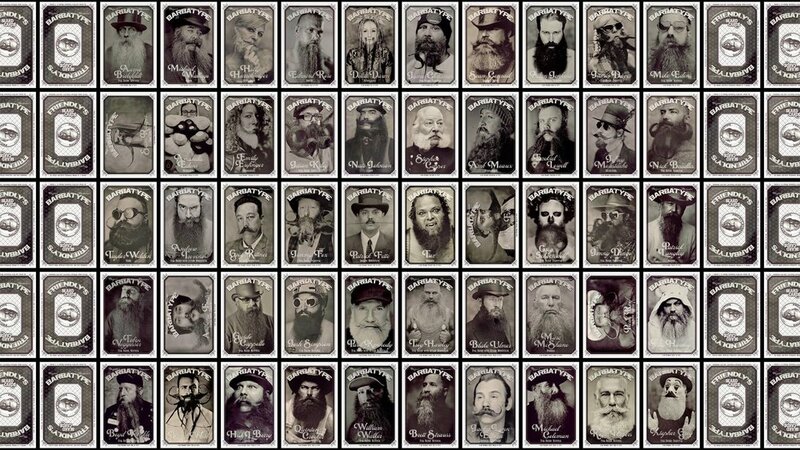 A set of 50 Beard Cards produced in collaboration with Joe Freindly Photography. Joe does many of the official competition portraits for beard contests across the country. This handsome set of 50 cards on super-thick stock will be a cherished addition to your collection. Rumor is that they are already increasing in value (I read that somewhere), so get yours now while supplies last!